Is Gujarat government refusing to spend enough on social sector in accordance with its capacity, as reflected in its high value of the gross state domestic product (GSDP)? It would seem so, if the latest data, released by the Reserve Bank of India (RBI) in its “State Finances: A Study of State Budgets 2915-16”, are any indication. The RBI study has found that, among the 18 states bracketed as “non-special category”, Gujarat’s spending in social sector as percentage of GSDP is one of the lowest in India – just about 5.9 per cent, as against the national average of 7.4 per cent. 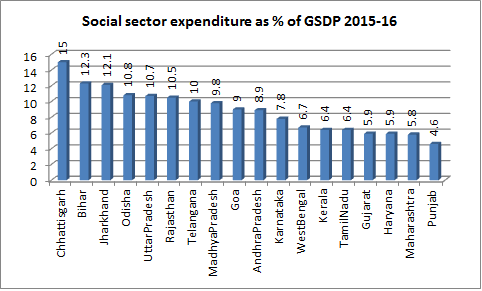 Among the 18 non-special category states, the RBI data show, as many as 14 of them spend a higher on social sector as percentage of GSDP than .Two poorer states – Chhattisgarh and Bihar – are the best performers. They spend 15 and 12.3 per cent of GSDP respectively. Interestingly, RBI has provided details of Gujarat’s failure to spend enough on the social sector as percentage of GSDP at a time when its overall social sector expenditure has been going up over the years. Thus, as percentage of total expenditure, Gujarat government spent 42.1 per cent in 2015-16, which is the highest since 2001. 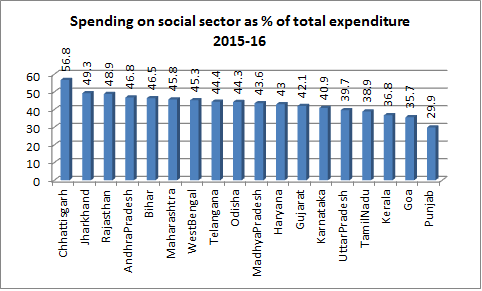 However, a comparison with other states suggests that Gujarat’s spending on social sector as percentage of total budgetary expenditure is less than as many as 11 of the 18 non-special category states, with Chhattisgarh (56.8 per cent) and Jharkhand (49.3 per cent) spending the highest proportion of amount. Relatively poor spending on social sector has come about, suggest RBI data, mainly because of Gujarat’s failure to spend enough on education – just about 15 per cent of the total budgetary spending. This is lower than 12 other states. 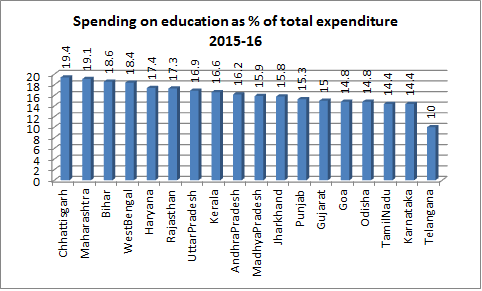 The states which spend the most on education are – Chhattisgarh (19.4 per cent) and Maharashtra (19.1 per cent). Interestingly, Gujarat’s expenditure on the health and family welfare is the second highest among the non-special category states, 5.9 per cent of the total budgetary expenditure, next to Rajasthan, 6.8 per cent.